Traditionally these were discarded stone or cement cattle troughs, filled with a well-drained soil mix and used to create gorgeous little miniature gardens. Nowadays there are ready-made concrete, stone or stone look-alike containers that are perfect, in a wide range of sizes. You can also make your own trough, using a special cement mixture known as hyper tufa. Almost anything that will hold soil and has adequate drainage may be pressed into service, so let your imagination run wild. Wooden boxes, wicker baskets lined with sheet moss, metal, terracotta, fibreglass or plastic pots all have possibilities. No additional fertilizer should be required for the first season. Place and plant your Rock Stars®, add a decorative rock or two and mulch the soil surface with decorative gravel and water well. Because the surface gravel will always look the same, we suggest checking how dry your trough is by poking your finger into the soil. A small trough may need water almost every day during the warm part of summer, a larger trough about three times a week, as a general guide. Because the soil mix is so well drained, alpine troughs are fairly forgiving of being overwatered so long as there are adequate drain holes to get rid of any excess water. See the PDF version of this article for ideas on fertilizing, overwintering methods and remaking your alpine containers. As a general guide, choose plants rated at least a hardiness zone or two colder than where you live. 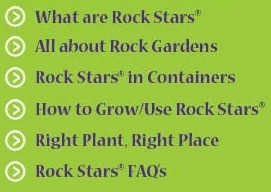 If you live in Zone 5, for instance, then select Rock Stars® with a hardiness range of at least Zones 4 to 9. 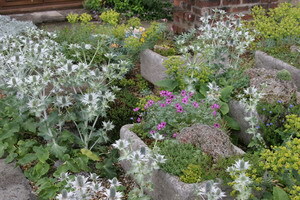 Think of your trough as being a miniature landscape, and let that guide you when selecting plants. Aim to build a little collection of plants with different forms or shapes. See our page called Right Plant, Right Place for more ideas on selecting plants with different shapes, plants with a similar rate of growth, and ways of extending interest over a longer season.